New U.S. solar power installations this year are set to break all previous records by more than doubling what was installed last year with 16 billion new watts of photovoltaic (PV) capacity. The total operating solar PV capacity in the U.S. is expected to reach 25.6 gigawatts (billion watts or GW) of direct current (DC) by the end of the year, according to GTM Research's U.S. Solar Market Insight Report 2015 Year in Review. When accounting for all projects (both distributed and centralized), solar accounted for 29.4% of new electric generating capacity installed in the U.S. in 2015, exceeding the total for natural gas for the first time. By 2021, GTM Research predicted the U.S. solar market will exceed 100GW of total solar capacity. "The U.S. is indeed the fastest developed growth market for solar globally and in 2016 will be the highest growth market overall," said Mohit Anand, GTM's senior analyst for Global Solar Markets. The U.S. is expected to install 16GW (16,000MW) of new solar power this year, leading all other developed nations in solar power installations. One of the factors spurring growth last year and this was the impending expiration of the U.S. government's solar investment tax credit (ITC). That measure, passed in 2008, offered a 30% tax credit for residential and business installations. It was due to expire this year, and the tax credit was supposed to drop to a more permanent 10%. In December, however, Congress passed a three-year extension on the 30% ITC. "Starting 2017, that growth rate will temper down drastically, but [the U.S.] will still be in the top five [nations for solar installations] starting 2018," Anand said. Even as distributed solar installations have grown, 2015 saw total electricity sales fall for the fifth time in the past eight years, according to the U.S. Energy Information Administration (EIA). 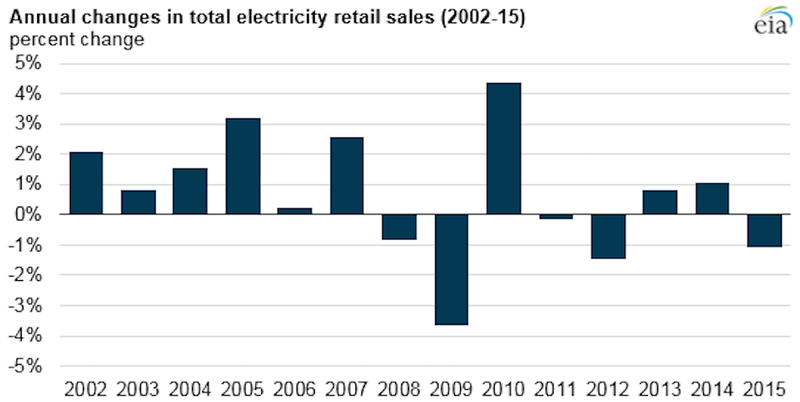 In 2015, electricity sales fell 1.1% from the previous year. In 2015, total electricity sales fell for the fifth time in the past eight years, according to U.S. Energy Information Administration. The declining rates of electricity demand reflect both a market saturation in electrical capacity and increasing efficiency of electricity-using devices. The EIA also cited a "changing composition of the economy," which has reduced the role of electricity-intensive manufacturing. Meanwhile, Deutsche Bank believes the cost to finance solar installations will also drop from 7.9% in 2014 to about 5.4% this year. Financing for installations is expected to stabilize at around 6.5% by 2019. 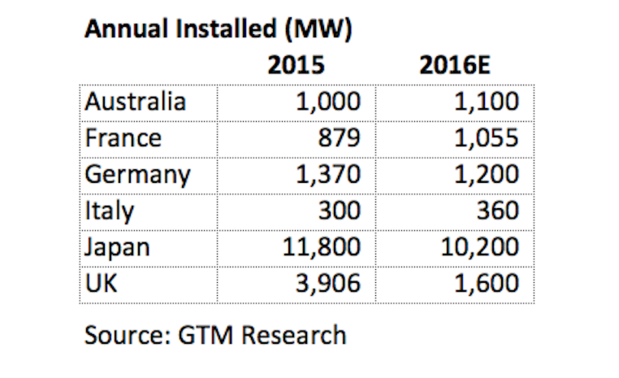 The GTM solar power report, published in conjunction with the Solar Energy Industries Association (SEIA), predicted 2016 will see 900,000 new, individual solar installation projects. Last year, solar installations broke all previous records, but the amount was only 16% more than in 2014 with 7,260GW of new DC solar power. This year, however, marks the greatest year-over-year growth in history, GTM said. Utility-scale solar installations will represent 74% of the installations for 2016, though residential and commercial markets will also experience strong growth in 2016. In fact, the U.S. is on the verge of its one millionth solar installation milestone. 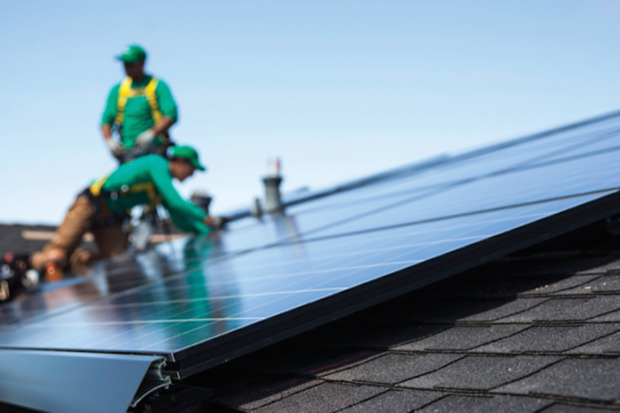 "Year after year, we're seeing the demand for solar energy in America skyrocket, and the benefits that brings to both our nation's economy and environment are staggering," said SEIA CEO Rhone Resch. "As we gear up for what's expected to be an unprecedented year for our industry, and nation, this report reveals just how important it is to maintain smart, effective, forward-looking public policies, like the ITC." The residential PV market experienced its largest annual growth rate to date, an impressive feat given that 2015 marked the fourth consecutive year of greater than 50% annual growth. In 2015, residential solar power installations once again represented the fastest-growing sector in U.S., with more than 2GW added for the first time in a single year -- a growth rate of 66% over 2014. Utility solar power also had a record year with more than 4GW of new power installed, up 6% over 2014, with nearly 20GW of new solar still in development, GTM said. Thirteen states installed more than 100MW (mega watts or millions of watts) of solar each in 2015, up from nine states in 2014. Almost 40% of the distributed PV capacity in the U.S. is located in California. The next nine states after California account for another 44%, according to the EIA. California's leadership in distributed solar capacity is driven by a combination of factors, including high electricity prices, a large population, strong solar resources, and state policies and incentives that support solar PV, according to the EIA. North Carolina also saw record PV growth, coming in right behind California as only the second state to have added more than 1GW of new utility photovoltaic solar power in 2015. The U.S. energy storage market also just experienced its best quarter and year ever. The U.S. deployed 112MW of energy storage capacity in the fourth quarter of 2015, bringing the annual total to 221MW. That represents 161MW hours (MWh) of power for the year. The 112MW deployed in the fourth quarter 2015 was higher than all storage deployments in 2013 and 2014 combined. Propelled by the historic quarter, the U.S. energy storage market grew 243% over 2014's 65MW. "Energy storage is changing the paradigm on how we generate, distribute and use energy," said Matt Roberts, Executive Director of the Energy Storage Association (ESA). "With exponential growth predicted over the next couple of years, energy storage solutions will deliver smarter, more dynamic energy services, address peak demand challenges and enable the expanded use of renewable generation like wind and solar. "The net result will be a more resilient and flexible grid infrastructure that benefits American businesses and consumers," Roberts added.